Primer helps with paint adhesion and one coat of primer can reduce the color coats by a couple, especially on sharp edged pieces or with gloss paint. Also, if you want to drastically change the color of a kit, say turn a brown body tube white, primer is a huge help in getting a good, even colored coat down. If you want to make sure you have cleaned up a seam, or any modifications look ok, primer helps you spot errors. 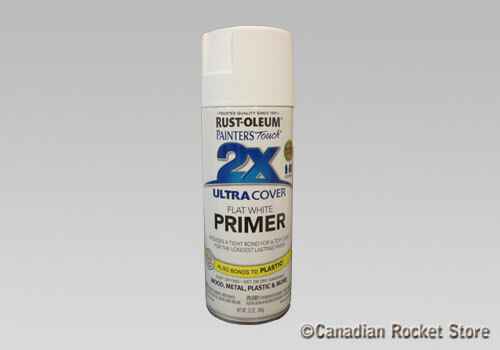 Use white primer as a base coat for white or very light colors. White primer can also be used to paint your model white. This primer can be used for models, ceramic, plastics, leather, stone, metal, styrofoam, crafts, wax, glass, paper, figures, fabric, wood and touching up purposes.